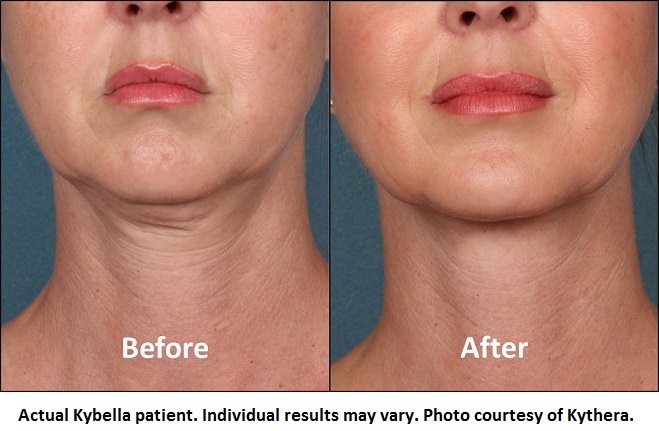 For clients who visit American Skin Institute for treatment of moderate to severe fullness in the submental area under the chin, commonly called “double chin,” our providers are excited to offer a revolutionary, non-invasive procedure called Kybella. Kybella is made of deoxycholic acid, a chemical naturally produced in the body. This double chin injection is one of the newest treatment options for submental fat, and can be completed in just a few short sessions, with virtually no down time. If you’re struggling with hard-to-lose chin fat, and diet and exercise don’t seem to help, please schedule a Kybella consultation in our Sherman Oaks, Westlake Village or Beverly Hills practice. Kybella is very different from other submental fat or double chin treatments in that it doesn’t require surgical incisions or down time. For example, one of the more traditional approaches to get rid of a double chin has been neck liposuction. During liposuction, small incisions are made near the earlobes or the chin, and the fat is suctioned out through a cannula. However, neck liposuction carries with it certain risks, including downtime, and often requires the need for a chin strap to hold the skin in place after the procedure is complete. Kybella, on the other hand, is a non surgical procedure that only requires a series of quick injections into the treatment site. During the procedure, your American Skin Institute provider will inject Kybella directly into the treatment area with a small needle. Once injected, the deoxycholic acid in Kybella begins to destroy the fat cells at the treatment site. As the cells are destroyed, they are removed out of your body through the lymphatic system, causing the double chin to shrink gradually. Double chin treatments with Kybella can provide nearly-permanent results because the deoxycholic acid destroys fat cells in the area. This means that, unless you experience significant changes in your diet or lifestyle habits, excessive amounts of fat should not develop in the treatment site at a later time. Results from Kybella injections will appear gradually and become more noticeable with each treatment. Typically, patients see the best results after approximately 2-4 treatments. American Skin Institute providers work very hard to make Kybella injections as comfortable as possible. For example, your provider will use either a local anesthetic or a numbing cream to remove sensation from the treatment site during the procedure. Further, although deoxycholic acid may sound dangerous because it has the word “acid” in it, Kybella has been FDA approved specifically for double chin injections, and will cause only minimal discomfort during treatment. Most American Skin Institute patients tolerate this procedure very well, and even have it done during their lunch break, because there are virtually no side effects after treatment. 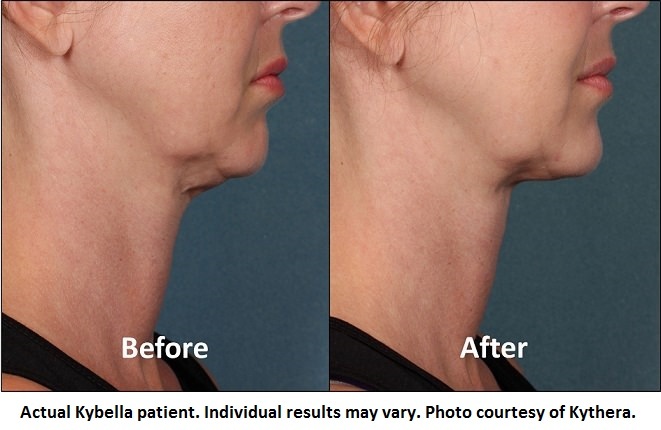 Can Kybella Treat Other Parts of the Body? No. 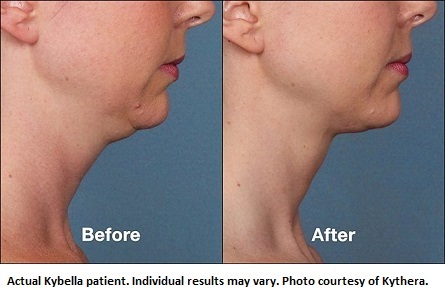 Although Kybella can theoretically be used to address pockets of fat in other parts of the body, it has not been FDA approved to be used for purposes other than to get rid of a double chin. At American Skin Institute we take patient safety very seriously and only use Kybella according to accepted guidelines. The typical American Skin Institute patient will need 2-4 Kybella injections to see the best results. This will of course depend on the size of your double chin and the aesthetic goals you would like to achieve. The treatments need to be performed approximately 1 month apart, so that the deoxycholic acid has time to affect the fat cells, and the lymphatic system is able to remove the dead cells from the body. If you’d like to learn more about Kybella and how our providers use it to shrink a double chin, please contact our Sherman Oaks, Westlake Village, or Beverly Hills practice for a consultation. Or, simply fill out the Contact Form below to schedule your Kybella consultation.